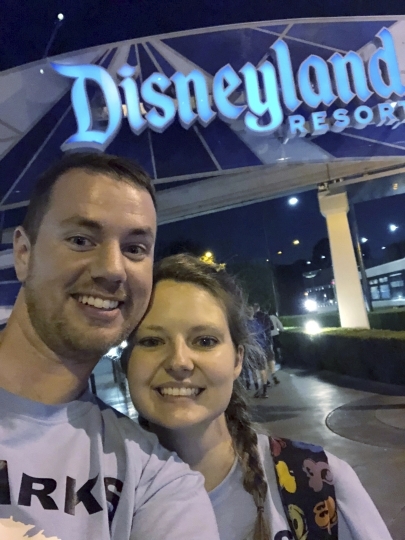 ORLANDO, Fla. — Heather and Clark Ensminger breathed sighs of relief when their Los Angeles-bound plane took off from Florida on time: Their biggest hurdle was now eliminated for achieving their goal of visiting six Disney parks on two coasts in one day. They succeeded Wednesday, visiting four Disney parks in the Orlando, Florida, area and two in Anaheim, California, with a 2,500-mile cross-country flight and two time zones in between, all within 20 hours. "It was incredible, unbelievable, surreal," Heather Ensminger, 30, said in a phone interview early Thursday as the Kingsport, Tennessee, couple prepared to return to the California Disney parks for a second day. Adding to the surreal feeling, they said, was the media interest in their Disney pilgrimage after an Associated Press story about their plans was published. As they traveled from park to park, they were bombarded with calls and texts from radio stations, TV outlets and newspapers, wanting to know where they were on the journey. A camera crew from Disney World's publicity office tracked them down for an interview, and they were stopped by Disney guests who recognized them from media reports. They also updated friends and fans of the Disney parks throughout the day, with posts on a Facebook page for Heather Ensminger's travel-agent business. The trip was planned for their 10th wedding anniversary, but it also marked a sadder occasion: the first anniversary since Heather Ensminger's father had died. Last year, a few days before the Ensmingers planned to visit Walt Disney World in Florida for a vacation with her parents, Heather's father had a fatal heart attack. "A couple months ago, I was having a hard time with the anniversary of my dad's death and my husband began planning the trip without letting me know," Heather Ensminger said. She ultimately was tipped off by her credit card company after Clark used points to pay for part of the trip. The Ensmingers love all things Disney, and even though they live in Tennessee, they are annual passholders to Disney World. At one time, they were visiting the theme park resort six times in a year. After an evening flight to Orlando, the couple arrived at Disney's Hollywood Studios on Wednesday at 6:15 a.m., Eastern Daylight Time, and were the first people let into the park when it opened for breakfast at 7 a.m.
About two hours later, they went to Epcot, and by 10:30 a.m. they were at the Magic Kingdom where they drank apple cider at Gaston's Tavern. Following lunch at Animal Kingdom, they made it to Orlando International Airport by midafternoon. The flight was the worst part. To save money, they both sat in middle seats, five rows apart. Clark, who's about the size of an NBA player, endured a tight squeeze as his knees hit the seat in front. The plane touched down at Los Angeles International Airport about 6:45 p.m., Pacific Daylight Time, and, after navigating rush hour traffic, they were at Disney California Adventure Park more than an hour later. Before leaving Disneyland at 11:30 p.m., Pacific Daylight Time, they sat down on a bench on Main Street and just soaked it all in. "We took five minutes to just look at each other and say, 'Wow we did it! What a great day," Heather Ensminger said.